The electricity bill from power utility CEZ with number 310 189 868 109 in the name of Mariya Nedelcheva and her account were closed in the first half of last month (May 2017). This bill is for the apartment on 25B “Nikola Yonkov Vaptsarov” Blvd., appt. 4, which the Bulgarian MEP has rented for BGN 400 (€ 200) from a company owned by the Sofia Municipality, an investigation by Bivol showed. In response to a question from our media, the nominee of the ruling Citizens for European Development of Bulgaria party (GERB) for EU commissioner said earlier that she had used the property from October 2010 to May 2013, when she terminated her contract with the municipal company “Zavodproekt”. The facts now reveal that Gabriel’s relationship with this dwelling lasted for another four years, albeit with a terminated contract. 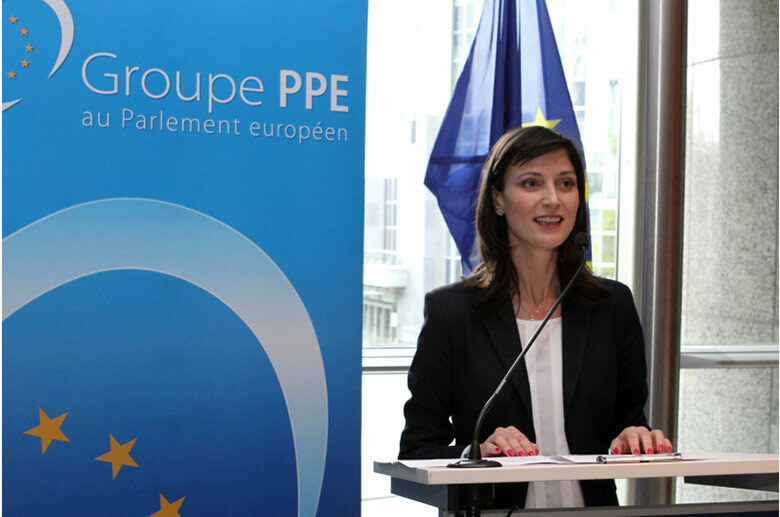 Mariya Gabriel was nominated for EU Commissioner by the government of Prime Minister Boyko Borisov on May 10th. In the following days, she rushed to get rid of the discrediting information and deleted the client number for the cheap apartment. It is currently listed at CEZ in the name of the owner company. Why did Mariya Gabriel, whose maiden name is Nedelcheva, continue to pay the electricity for the apartment until May 2017 if she or her relatives did not use it? So far, she has firmly refused to answer our questions. Answers have not been received by the A-specto magazine as well, which was the first one to publish the information about the cheap municipal apartment. As early as in 2014, Mariya Gabriel explained to journalist Kalin Parvanov from Thema (Theme) magazine that she has “asked for help” and received the dwelling to “store some of her stuff” and not to take advantage of a cheap apartment. This means that the apartment had been used in connection with her functions as a Member of the Parliament. The only institution to which the MEP could turn for help was the Sofia Municipality, which is ruled by her GERB party. Sofia Municipality is the ultimate owner of “Zavodproekt”, which manages the home. The Sofia City Council is dominated by the same political party, who sent Gabriel to Brussels: the center-right GERB. The market rental price for such apartment is between three and four times higher than BGN 400 (€ 200). If we assume that the monthly municipal assistance for our European representative was about BGN 1,000 (€ 500), this amounts to BGN 32,000 (€ 16 000) for the period of the official contract, or until May 2013. But if Gabriel continued to use the housing for storage until May 2017, the amount of this aid swells to BGN 80,000 (€ 40 000). Gabriel’s declaration to the European Parliament from 2012 bears no sign of this “help”. Gabriel left unanswered Bivol’s question why the help was not declared. She also did not answer the question whether she or her relatives had used the dwelling in one form or another after her rental contract with “Zavodproekt” was terminated. Who is this person lucky enough to find exactly this lucrative advertisement, which, according to the Director of “Zavodproekt”, Assen Dermendzhiev, has been published in the site imot.bg? This is hardly a random person since they had the privilege of having a MEP personally pay their electricity bill for four years. “Zavodproekt” owns dozens of homes that it rents to selected people and companies at prices below market rates, Bivol revealed. This dubious housing fund has long managed to avoid public attention and the list of its not-so-random tenants remains a well-kept secret, as evidenced by the Zavodproekt’s reply to municipal councilors Ivo Bozhkov and Martha Georgieva. After they formally requested information about the homes owned by the company, they received a list of properties that does not even contain addresses. This mysteriousness also leads to the hypothesis that the apartment on 25 “Vaptsarov” Blvd. was not used just for office-related “storage”, but Gabriel lived there and this was her main residence in Sofia, while the mysterious tenant who came across the ad in imot.bg is just a dummy, a person sufficiently connected with the family, but probably not a close relative. Bivol sent questions about the assistance received by Mariya Gabriel to the press office of the European Commission and the European Parliament. In a move unusual for these institutions, they also kept silent. According to the renowned site Politico, however, the subject is being discussed in Brussels, and the forthcoming hearing of the Bulgarian candidate for EU Commissioner may get “spicy”. This is something that Bulgarians have become accustomed to after the failure of Rumyana Zheleva, whose unreported involvement in a company connected to the former Communist secret services, disqualified her in 2010. This revelation was also made by journalists Atanas Tchobanov and Assen Yordanov before they founded the “top investigative site Bivol“, as defined by Politico. The above investigation was conducted by Assen Yordanov, Atanas Tchobanov, Kalin Parvanov and Dimitar Stoyanov.